Manchester United goalkeeper David de Gea says he is focused on "winning games, rather than contracts", despite being yet to agree a new deal. The 27-year-old's contract runs out next summer, with the club having an option to extend to 2020. 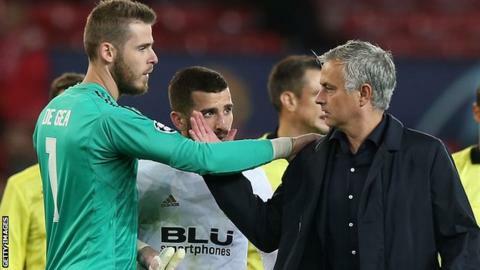 United manager Jose Mourinho has said he is "not confident" the Spaniard will sign a new contract, but De Gea insists he is "very happy" at Old Trafford. "You have to be focused on what's important," he told Sky Sports. In August, United were positive over the chance of De Gea renewing his deal, but Juventus have reportedly targeted the Spain international as another low-cost high-quality addition after picking up Liverpool midfielder Emre Can, Barcelona full-back Dani Alves, Bayern Munich midfielder Sami Khedira and Athletic Bilbao striker Fernando Llorente on free transfers in recent years. "If the club want to be better than it is and not worse, obviously it would be very important to keep David," Mourinho said in an interview on Friday. De Gea, who joined United from Atletico Madrid in 2011 in an £18.9m deal, is one of several players nearing the end of their deals. "I've been at the club for eight seasons now. I'm very happy here," said the keeper, who has been the Premier League club's player of the year for the past four years. "I always feel that warmth from the fans and everyone who works at the club."